The fact that countries which have moved toward middle-income status have started by transforming their agriculture sector is no longer debatable. Unfortunately, out of 54 countries in Africa, Ethiopia is mentioned as the only one on the path to meaningful agricultural transformation. The rest are still running from pillar to post, chasing different prescriptions. During one of the endless talk-shows in Africa, an official from the Africa Development Bank (ADB) recently lamented that his institution had spent more than US$2 billion in the last decade trying to set up agricultural commodity exchanges in Africa with no success. Besides such a scandal resulting from top down approaches, lack of genuine collaboration between government departments, development agencies and the private sector has impeded agricultural transformation in Africa. Given the scale of food insecurity and youth unemployment in Africa, it is a myth that these challenges can be addressed through a few value chains. No matter how well-intentioned, the current crop of agribusinesses will not be able to create enough employment for the majority of Africans, even within 100 years. Most contract farming arrangements and inclusive business models across Africa are not just working with a narrow minority of farmers and economic actors. They also tend to be rapacious initiatives where smallholder farmers are preyed upon in the name of inclusion. In spite of all the rhetoric, there is no way irrigation schemes in a rural areas can represent the success of inclusive agribusiness modelling. Given their location in dry areas, most irrigation schemes have been set up to supplement local food and income needs not to lift people out of poverty, create meaningful employment and drastically change lives. Beginning 2019, governments and development agencies should wake up to the fact that modern commerce is not responsive enough to the immediate needs of smallholders and rural people. They should carefully and thoughtfully learn from holistic socio-economic approaches used by smallholder farmers and rural economic actors including youths and women. Models that can lift millions of people out of poverty are required. In all developing countries, more than 90 percent of farmers, youths, women and other economic actors are excluded from value chains and inclusive business models. If formerly employed people can moonlight and engage in side-businesses to try and meet their needs, why should smallholder farmers with even fewer income sources be locked in value chains where they do not get enough to sustain themselves? Like everybody else, smallholder farmers and rural people survive through juggling scarce resources and experimenting with several opportunities ranging from rural and non-rural to agricultural and nonagricultural. They do not see value in being stuck in a few value chains when diverse options exist in informal markets which are increasingly becoming sources of dynamic employment opportunities and nutrition. The proliferation of informal markets in all African countries is a clear reflection of the extent to which income diversification is more important for farmers and rural people than locking them in modern value chains which do not provide sufficient income. Instead of pursuing development agendas that promote formal and global markets, in 2019 African policy makers should invest in understanding interdependencies between formal and informal markets. That is how they can know the diversity of smallholder livelihoods combining formal and informal, farm and off-farm, urban and rural activities. They will also become aware of the role of traditional institutions, social structures influenced by religion or kinship ties and neighborhood relationships in shaping resilient rural socio-economic norms. Trying to modernize agriculture through commodity exchanges and warehouse receipt systems without taking these issues into account will be a waste of resources. 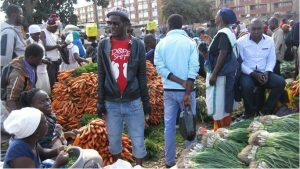 Rather than condemning informal markets, progressive policy makers should try to understand why the majority of farmers, youths and women are preferring to work at the intersection of formality and informality. It is also important to examine how smallholder farmers and rural people are responding to rapid economic modernization whose effects are being felt at community level through the fluid relationship between villages and towns. Livelihoods are becoming complex combinations involving multiple informal arrangements where youth are seizing opportunities to move in and out of agriculture in response to fluid economic opportunities rather than be chained to value chains. Development agencies and policy makers will also realize that contrary to the so-called rural-urban divide, there is increasing interweaving between rural and urban economies across Africa knitted with extensive kinship ties that strengthen rural and urban distribution of opportunities. An important component of the economic mix is the exodus of youths from rural areas to cities and neighboring countries and back. For instance, thousands of youths migrate between Malawi, Zambia, Mozambique, Zimbabwe and South Africa during certain seasons of the year when agricultural production activities are low in their home areas. When policy makers study these patterns they will realize the power of remittances in agricultural and rural development. Instead of easy of doing business incentives targeting foreign investors, they should also be extended to innovative local people who keep rural economies vibrant and resilient. This entry was posted in Agricultural Intelligence, Agricultural Markets, eMKambo and tagged 2018, 2019. Bookmark the permalink.